The question that begs itself here is whether or not Marx and his followers did in fact ever envisage the kind of society Deutscher ascribes to them. Deutscher produced no evidence to show that Marx and his associates had envisaged that kind of spirit of tolerance, integrityand love in their relationship with fellow human beings, which could be conducive to the building of a Free Society. On the contrary, Marx and his associates employed the very tactics and methods rejected and denounced by Deutscher when used by the disciples of Marx in every existing socialist controlled country. “Bakunin … a colourful romantic rebel had built up a following in Italy, in Switzerland and in Spain … He established an organisation the Alliance of Socialist Democracy, in Switzerland. In the summer of 1869 he and his followers were received in the International. 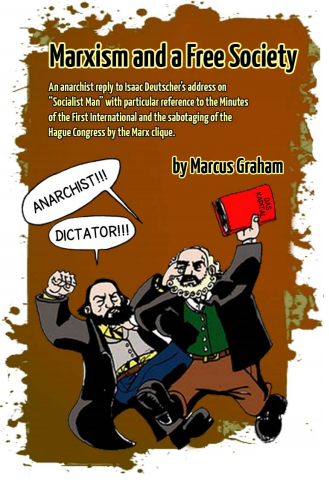 “Bakunin held forth at the Basel Congress of 1869 … His personal magnetism, persuasive diction and capacity to win intensely devoted followers made him the menace. Marx and Engels set out to destroy him, using the Hague Congress for that purpose. It was the one Congress of the International which Marx and Engels attended. Bakunin could not come there for he could not travel through France or Germany, where he was ‘wanted.’ He had to rely on James Guillaume, the editor of theBulletin Jurassien and leader of the Jurassien Federation, the anarchist organisation of Geneva building-workers and watchmakers in the sweatshops of the Jura mountain valleys … Cafiero, a twenty-five year old convert to Bakunin’s cause, had organised the Italian anarchist-minded sections into a federal council and at the founding Congress at Rimini ‘before the workers of the world’ he had declared that the new federation was breaking off all ties with the London General Council because the latter wished to impose the doctrine of the authoritarian German Communists upon the International. Hence the absence of any Italian delegates at The Hague. “Schwitzguebel declares he is convinced that his conviction has been a foregone conclusion; he says he will remain loyal … to the I.W.A … even should he be expelled.”pp. 228-229. (According to Guillaume, Schwitzguebel confined himself by saying: “We have been condemned in advance, the workers, however, will condemn the decision of your majority.” L Internationale, Documents et Souvenirs (1864-1878), Vol. II, p. 348. (Gerth’s footnote, p. 29 of Minutes). It was, of course, difficult for Deutscher, being himself a marxist, to realise that the basic foundation upon which centralisation rests is authority and authority cannot be enforced without recourse to every form of repression, including the killing of political opponents.Every past and present Government, regardless of whatever label it carries, fully attests to this fact. To contend, as Deutscher did, that a triumphant marxist State could or would ever lead to the building of a “classless and stateless society free from social and political oppression,” is to engage in pure fantasy. 1. Letter of September 12 and 17, 1874, The Selected Correspondence of Karl Marx and Frederick Engels, 1846-1895, International Publishers, New York, 1942, p. 330. 2. The Selected Correspondence of Karl Marx and Frederick Engels, p. 327. 3. Gustav Mayer, Engels, p. 227. 4. Briefe und Auszüge aus Briefen von Joh. Phil Becker, Joe Dietzgen, Friedrich Engels, Karl Marx, u.A. an F.A. Sorge und Andere (Stutgart, 1906), p. 597. 5. E.H. Carr, A Study in Fanaticism: Carl Marx, p. 146. 6. E.H. Carr, A Study in Fanaticism: Carl Marx, p. 247. 7. Franz Mehring, Karl Marx, Geschichte seines Lebens (Soziologische Verlagsanstalt, Leipzig, 1933) p. 539.